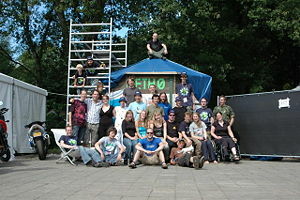 Eth0 was part of the force behind Event:HAR2009. We provided various services and helped around with getting things done. For more info see har2009.org. What did eth0 do @ HAR2009? A server hosting facility with high speed network, stable/redundant power supply, a 10Gig-E Internet uplink, sufficient cooling and a security and monitoring system. This page was last modified on 26 September 2010, at 16:28. This page has been accessed 15,462 times.